I promised another cork craft in the 12 Days of Christmas series and I am thrilled to bring you this “Mini Memo Cork Board”. So cute, so fast so easy. The first step is to (hot) glue 5 corks to one of the strips of cardboard, making sure to place any logos facing whatever direction you want. 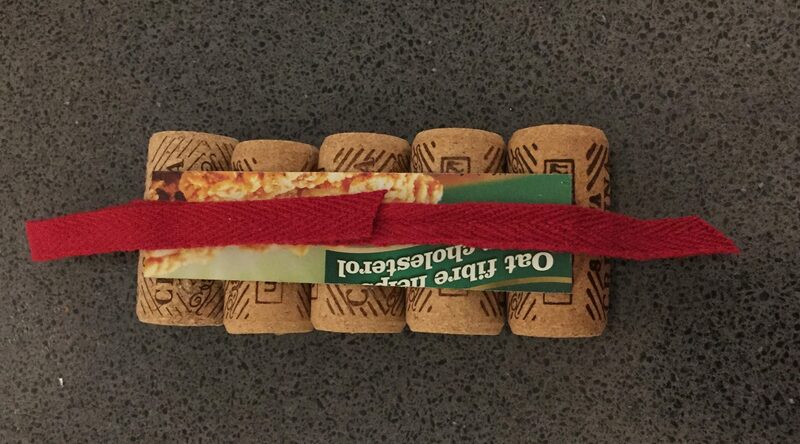 Be sure to use plenty of hot glue to attach the corks. 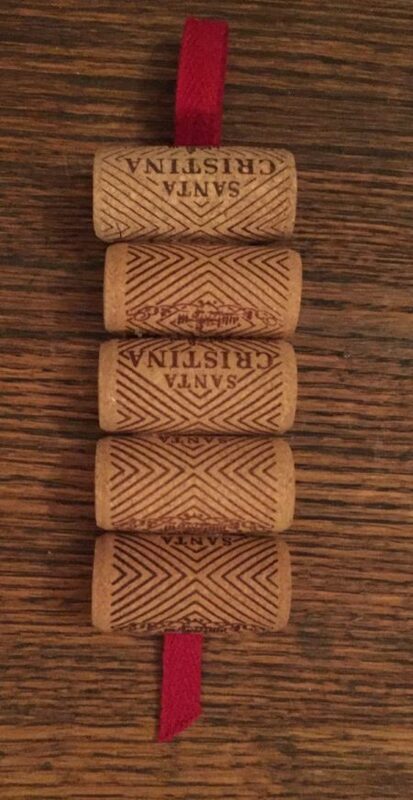 The top and bottom cork should both slightly hide the top and bottom of the cardboard. Next, you will attach the ribbon to the cardboard (refer to picture above). 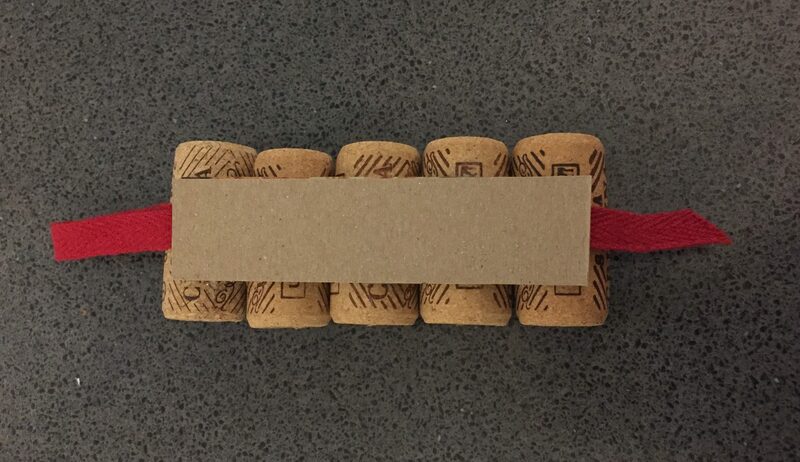 Flip your cork pieces upside down so that the cardboard strip is showing. Run a line of (hot) glue length-wise down the middle of the cardboard and immediately lay your ribbon onto the glue. Leave about an inch of ribbon hanging from the bottom of the cardboard and the rest of the ribbon hanging off the top. Now you’ll form the loop at the top of the piece. Run another line of hot glue directly over the ribbon starting at the top and run it as far as needed. Now fold the extra ribbon at the top over, making a loop about an inch or two in length above the cardboard. Press the loose end into the fresh glue. Finally, cover the cardboard with hot glue and press the second piece of cardboard over it, sandwiching the ribbon in between the two cardboard pieces. Cut the bottom end of the ribbon in a slant or a v-cut. Wait for the glue to dry and you are done! I used one on my fridge hanging if from a magnet hook (top picture) I already had but I think I will attach a magnet on the back so it can sit flatter on the fridge. I even made one for a friend. Mini memo cork boards for you and a friend, it’s A Wandaful Thing! 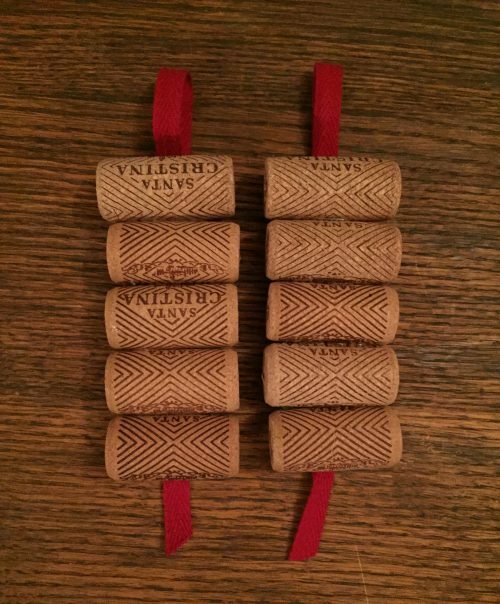 This entry was posted in 12 Days of Christmas, Decorate, DIY, Make and tagged 12 Days of Christmas, cheap, Christmas, cork, corks, Crafts, creativity, Decorate, DIY, easy, ideas, inexpensive, repurpose, reuse, simple. Bookmark the permalink. Cute idea. Will have to drink more wine to get more corks! !